Inside one of the hundreds of tents outside Moria, the reception and identification centre on the Greek island of Lesvos, three women from Syria talk about their life in Syria before the war and about the conditions on the islands. They are afraid that what they may say may affect their chances to get out of the island so they don’t want to be identified or photographed. But they are more than willing to tell their experiences since they arrived. When they speak about Syria before the war, their eyes glow; they describe it as if it was paradise on earth. But then war came, everything changed and they had to flee. Two of them arrived on the island seven months ago while the other has been there for just one month. When they start describing Moria and their lives there they all tear up. Moria is a horrible place, comparable to war-torn Syria. “If I knew of the situation here, I would have stayed in Syria, under the bombs. At least we had a house there, not tents,” says the oldest one. After the EU-Turkey Statement which was implemented in order to stop the refugee flow in Europe, the EU’s hotspot mechanism was put into action in Greece. The hotspot approach was initially presented in 2015 in the European Agenda on Migration. It essentially means the creation or reception and identification centres in areas that refugees arrive. One of these areas is Lesvos and Moria was used as reception centre for refugees for a while is essentially Greece’s first hotspot. In a way the EU-Turkey Statement legitimised the EU’s main approach to migration. Moria is also Greece’s most infamous hotspot due to the sheer number of people and horrible living conditions. At the time of the writing more than 5800 people reside in an area that can only host 3100. Previously a military base, it now has the population of a small Greek town with living conditions not suitable for any human being. Riots and fights take place on a daily basis while those living there fear for their safety. 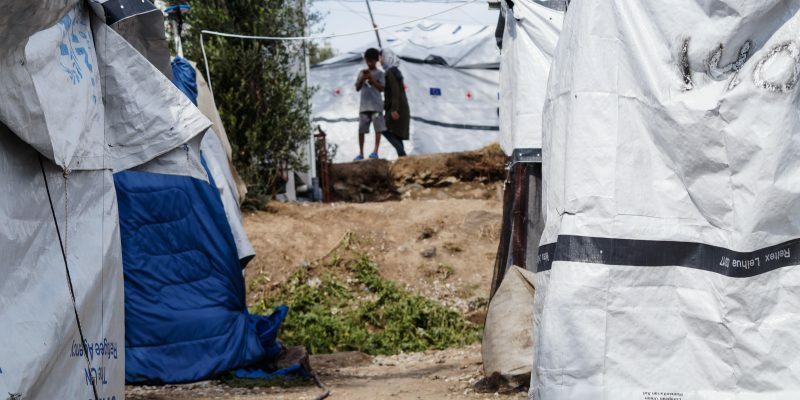 Due to overcrowding of the main camp hundreds of tents have been set up by organisations in an area known as the “Olive Grove” which, at first sight, seems to be separated in different sections where different ethnicities live. International human rights organisations have condemned the situation at Moria and have stressed out the need for its decongestion. A report published by the International Rescue Committee in September gives emphasis on the impacts of the camp to people’s mental health and describes the situation as a mental health crisis. The report’s results are striking. From their 126 clients 64% suffer from depression, 60% are suicidal while 29% have tried to kill themselves, 15% have resulted in self-harm, 41% have symptoms of Post-Traumatic Stress Disorder (PTSD) while 6% show psychotic symptoms. The oldest of the three women came to Greece with her family including her son who is in his twenties. As she describes while he was in Syria he was a very active young man with a lot of friends, but when he came to Greece his mental health started deteriorating due to the conditions. One day while he was waiting in the food line for hours, he was attacked and stabbed by someone. He never went to the food line again. He is also suicidal and can barely leave his tent. As the youngest woman of the three listens she recognises some of the patterns in her husband’s behaviour. “My husband has mental health issues from back home. But they gave him paracetamol,” she says. The experiences of those in Moria, what they have endured before escaping from their countries and during their journey can be traumatic. Some have been imprisoned, tortured or raped. The camp’s conditions can be a trigger for their trauma. 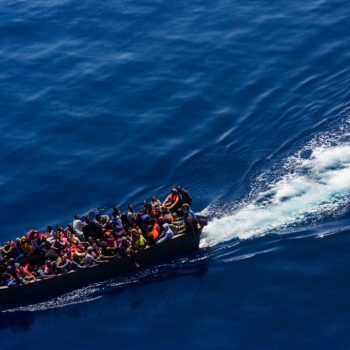 According to Alessandro Barberio, from the Mental Health Department of Trieste and a psychiatrist with Medicines Sans Frontiere (MSF), those who arrive on the island are those who survived the hardships of their countries. However, the lack of proper accommodation, long term waiting, and deplorable conditions can bring out previous traumatic experiences or create trauma. “When people arrive here, sooner or later, quite often sooner, they start to show psychotic symptoms. I think this is related to the big trauma from their country and then the life conditions of the hotspot in Moria can easily be a trigger for psychotic symptoms – not only PTSD,” he says. He goes on to describe the life conditions of the camp as negative and counter-productive. The lack of hope, the lack of any expectation, the lack of an answer, and lack of human rights and the lack of humanity relate to and are triggers to their trauma. Some of the symptoms that he has noticed in his patients include disorientation, confusion, inability to contact with others or participate in daily activities. Previous trauma combined with current events can lead to hearing voices and seeing visions. “I know what I see, and I see new cases of people with psychiatric symptoms. These people were not psychiatric patients before. These symptoms, although related to previous trauma, are new to them. Morteza* lives at the upper part of the Olive Grove at the Afghan section of the camp – an area that seems to be forgotten by the authorities and the aid workers as it occupies a private property. He lives with his sister, brother in law and their children. He used to live in Iran, where Afghans have limited rights, moved to Afghanistan when he became an adult but had to flee his area after an attack by the Taliban that injured him. Morteza suffers from Attention Deficit Hyperactivity Disorder (ADHD) and depression. When he was in Iran he was under medication in order to treat the symptoms of ADHD but when he arrived in Greece he had to stop them. The pharmacies did not accept the prescription he had and the hospital of Mytilene told him he had to wait several months for an appointment. “ADHD can be very hard for adults. I cannot focus; I pause when I speak because I forget what I want to say. I forget everything all the time and this worries me because of my asylum interview. I write down everything in my notebook,” he says while showing a stack of yellow post-it notes he carries with him. Although primary health care is available on site the overwhelming conditions in Moria have brought the health services to their knees. 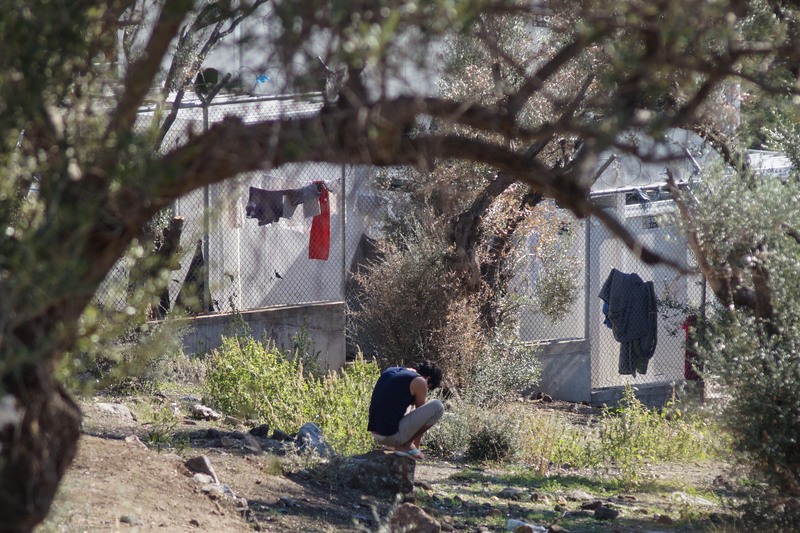 According to the report by the International Rescue Committee the Greek state that is responsible for the management of Moria is unable to support those living there, they cannot cover their basic needs including their physical and mental health. The oldest Syrian woman holds the hands of the other’s baby. Her son has become suicidal and has difficulty leaving his tent. Morteza seems desperate. His mental health has deteriorated and he is thinking of committing suicide daily. His interview for his asylum case is in the spring of 2019 but he seems has lost all hope. “I know I am not going to be here forever, but when I see the lack of human rights here, I see that there is no difference from the place I was before. How can I be hopeful about the future? I don’t want to be caged in this island for years,” he says. 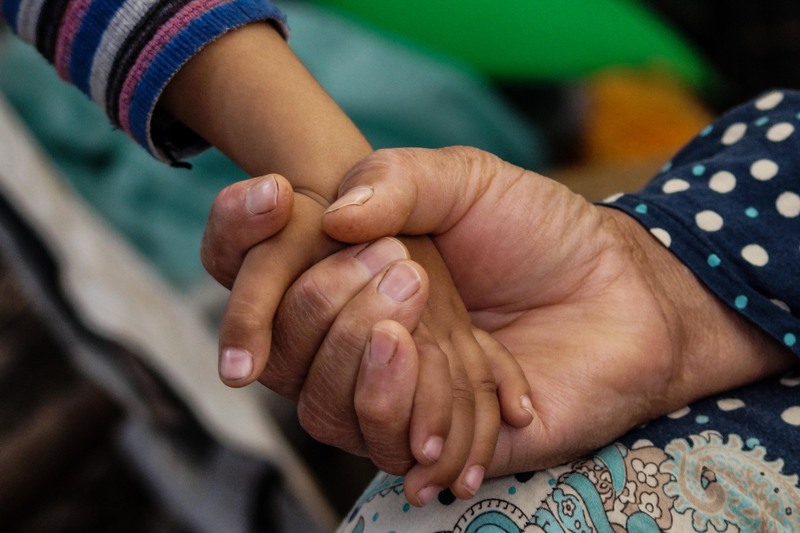 Refugees in Lesvos are forced, by the EU’s migration mechanisms, to go through a process that has direct impact on their lives and can have severe consequences to their mental health. Without a specific strategy or planning by the Greek authorities in order to solve the mental health crisis people are left in limbo. According to Alessandro Barberio staying on the island under the current conditions strips people of any hope and dream they may have had for their future. “People don’t have the possibility to think that tomorrow is another day because they are stuck here. There are, of course, those who are more resilient, they organise in groups, they take part in different activities but at the end of the day, they return to Moria,” he says. For the three Syrian women Moria is a terrifying place. They are afraid of their safety, they are afraid for the wellbeing of their children and their husbands. However, due to being from Syria they will eventually leave from Moria and will possibly be granted asylum in Greece. For Morteza, however, things will be harder and he already knows that. As metal music plays from his phone he mentions his only dream: to go to university and study philosophy because according to him philosophy can heal the soul. Since we last met, Morteza escaped from the island. On the same subject, read the opinion of Marco Bertotto – Advocacy Officer for Doctors Without Borders – who requested through our page that the Moria camp be urgently evacuated. What do or don’t you know about the refugee crisis in 2017?